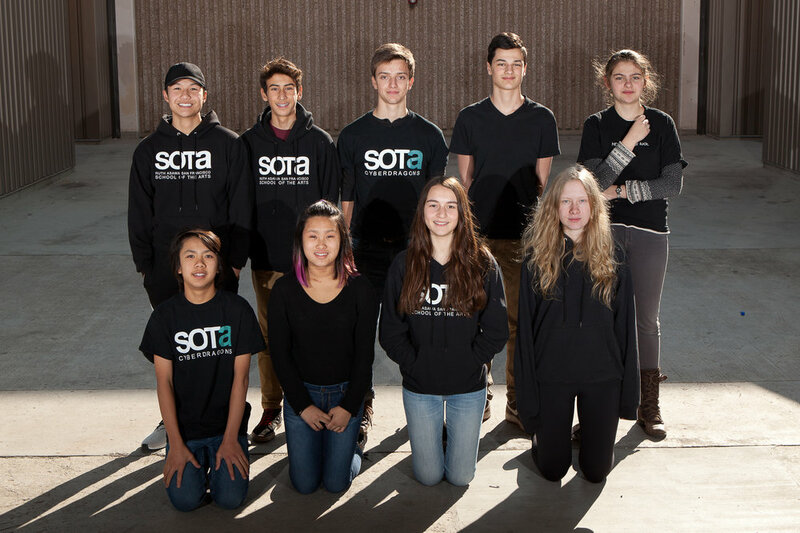 The SOTA Cyberdragons is a robotics team based in San Francisco, California. We participate in FIRST (For Inspiration and Recognition of Science and Technology), which is an international robotics organizations that includes thousands of teams and hundreds of thousands of students. Our robotics program fosters ingenuity and champions the growth of well-rounded life skills such as communication, proactivity, and leadership. We are a nonprofit organization that runs a high-budget, and rely on sponsor donations, both in-kind and cash, to support the work we do. 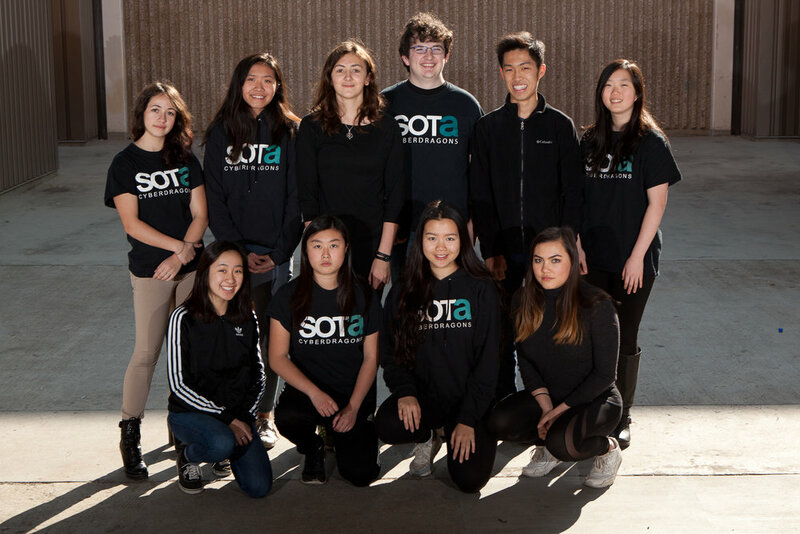 Started in 2014, SOTA Cyberdragons has been encouraging STEM (Science, Technology, Engineering, and Mathematics) through challenges tackled with modern technology. Throughout the years incoming members will develop a myriad of skills involving, cooperation and coordination. SOTA Cyberdragons is a team of artists from many backgrounds, banded together in order to form a unique innovation. Our very first competition was the spring break of 2015 at FRC's Silicon Valley Regional. Although we may have not achieved a notable rank, the experience we have gained from the competition will lead to our development as an outstanding team. This hypothesis proved to be true when in early October we competed in WRRF's CalGames 2015. Here our results were far better than we expected. We went home with two awards: the 2015 Highest Seeding Rookie Award and the 2015 Rookie Inspiration Award. Jumping into our second year, the team’s popularity skyrocketed as it more than doubled in size from five members the first year to around 30. While confronted with the challenge of management, the team received in return a bigger workforce. With the size of the team that year, we expanded our departments to include mechanical engineering, software development, and business development. That year at the Silicon Valley Regional, we came in better prepared and went home with the 2016 Creativity Award. With our first group of members graduated, the challenge of advancing forward began. Implemented the year before, the team’s role in documentation has become one of our greatest assets. The benefits of documentation allows us to prevent wasting vast amounts of valuable time deciphering problems when we have already figured them out in the past and instead use what we have learned to tackle the more advanced obstacles. An instance of this was when our mechanical engineers finally implemented computer vision tracking technology into the robot. In past years this project was too advanced and as a result low in priority. Having accumulated enough research over a few years, in 2018 our programmers finally attempted vision tracking, while applying all the prerequisite knowledge. Throughout the years we have participated in many events in our community, accumulated both volunteering experience and community outreach. We believe giving back to our community by providing exposure and inspiration to our youth is just as important as the experience of competition. From local Maker Fairs to demonstrations at elementary schools, we try our best to show parents and their kids that in their future opportunities that did not exist in the past, like FIRST Robotics, exist. We also like to give more opportunities to our members by reaching out to companies and organizations, that either sponsor the team or are interested in helping out, by providing connections and vocational insight into the tech industries of which they might be a part. From data analytics companies like New Relic to research and analytics companies like 3rd Stone Design, students have received exposure a wide variety of industries.